heories which have placed great emphasis on racial or national characteristics are out of favour with today's politicians in the West. This was not always so. The first half of the 20th century saw in Europe a rise of groups who espoused some form of racialism or nationalism, the most dramatic example of the trend being in Germany. Some commentators, seeking to account for the phenomenon, have looked at the qualities for which the Germans are famous - disciplined work, a love of order and a self-confidence bordering on arrogance - and produced reactions ranging from a mild distaste to an expression of their worst fears that here was a suitable breeding ground for totalitarianism and the party of the Master Race. (i) The Germans are a bad lot and not to be trusted an inch. (ii) The Germans would like to be good and occasionally are. Unfortunately as soon as some serious problem comes along (e.g. the 1929 crash) they revert to type and become nasty and totalitarian. This second view - the 'Dr Jekyll and Mr Hyde' analysis of nation states - enjoyed a burst of popularity in West Germany in the 1980s. At the end of 1982, with 2.5 million unemployed, many West Germans were nervously drawing parallels with events 50 years earlier. The coalition switch of the German Liberal party in September 1982, for example, was closely examined in order to detect any possible signs that it would lead to the kind of political instability which had plagued Germany in the early 1930s. Firmly opposed to theories (i) and (ii) is the idea, most eloquently propounded by David Hume in his essay Of the First Principles of Government, that politics is primarily a matter of opinion. Hume's analysis rules out the notion that there are latent urges in people which politicians can rapidly fashion into coherent political movements. The adoption by any country of a policy - say - of totalitarianism and extreme nationalism glorifying the state is dependent upon the successful development and propagation of an ideology of totalitarianism and extreme nationalism glorifying the state. The process of development and propagation will normally be measured in generations, that being the time required to alter a significant section of opinion in a given population. How does this theory square with the sudden and successful rise of the Nazi party between 1919 and 1933 and its equally startling disappearance from the German political scene after 1945? The answer to this question can be found only after we have distinguished between a political party and an ideology. The British Liberal party of today bears little resemblance to the British Liberal party of the mid-nineteenth century. Previously a party of laissez faire capitalism, it now owes much of its ideology to socialism, a political philosophy which its members have done little to develop. Between 1919 and 1933 Hitler and the leading Nazis were able to produce a superbly efficient party machine, but they did not add substantially to the nationalist ideas which had been developed before the formation of the party. An examination of these ideas reveals the extent that the Nazis were in debt to their more refined precursors of the Wilbelmenian period. The ascendancy of Classical Liberalism throughout Europe in 1850 proved to be illusory. Ideas developed on the continent during the next 50 years attacked and successfully diminished the influence of the English model of state and society. The attack came at several points. German social scientists contrasted the Gemeinschaft (community) with the Gesellschaft (society). The 'Community' stressed that the individual could only live a meaningful existence through partnership in a group. The cohesion of such a group was believed to be shaped by unconscious factors, by deep vital forces of instinct, growing organically as part of nature and independent of man's free will. The 'Society' emphasized the individual and his rational motives. 'Society' in this sense was declared to be characteristic of Western bourgeois civilisation; it demanded as its foundation a contractual fidelity which was not needed for the existence of the more primeval and immediate vitality of the 'Community'. Some Germans regarded Gemeinschaft as being peculiarly German (though Pan-Slavs have claimed it as specifically Russian) and extolled it above the mechanistic and legal superficiality of Gesellschaft. A frequent complaint was made against the economic and political conflict which is part and parcel of Western bourgeois society. Moments of temporary unity were exalted. The militaristic strain in German nationalism was also reflected by Werner Sombart, a leading economist of his time. He compared the nation of shopkeepers (Great Britain) with the nation of heroes (Germany). "We must recognise everything which resembles Western European ideas or which is even distantly related to commercialism as something much inferior to us . . Militarism is the supreme manifestation of the heroic spirit. It is the highest form of the union of Potsdam and Weimar. It is Faust and Zarathustra and the Beethoven scores in the trenches . . . ".8 It is normal now to stress the importance of intellectuals who left Germany after the Nazis came to power. In fact, the numbers of emmigrants were not to be compared with the leading figures in every field of intellectual activity who saw the Nazis as the solution to German cultural problems. Gottfried Benn, the poet, remarked, "There seems no doubt to me, that from this transformation [the Nazi take-over] a new man will come forth in Europe, half by mutation, half by breeding: the German man".9 It is clear that intellectuals both provided the ground for Nazism and remained true to the Nazi party when it took power. People who see the success of Nazism as the result of the 1929 economic crash, or some deeply ingrained characteristics and traditions in German society, or a combination of both, are not giving full due to one stark, simple fact; namely the development in Germany of ideas rejecting unashamedly the liberal-rationalist worldview. That these ideas should have been exploited by a more than competent politician who proceeded to give them a consistent application comes as a surprise only to those who have been reared on the compromises, the 'moderation' and the U-turns of post-war British politics. Germans (and in guilt-ridden , West Germany there are not a few) who search for revivals of Nazism in economically depressed conditions must explain where this revival will originate. And here, of course, they run into difficulties. There are in Germany today no substantial political movements committed to the overthrow of the typical 'Open' Western Society. In the 1920s both the Nazis and the communists were set on destroying it and one of them succeeded. In 2000 Neo-Nazis receive occasional headlines but can be expected to have as little significant effect on West German society as leftist terror groups like the Baader-Meinbof, and both movements are probably even less ideologically noteworthy than Oswald Mosley's British Union of Fascists of the 1930s. The disappearance of Nazism after 1945 has aroused much less interest than its growth up to 1933. This is probably largely due to the desire to equate Nazism and the Nazi party. Germany was defeated in 1945 and the Nazi party prohibited; therefore that was the end of Nazism (Q.E.D.). In fact, as I have tried to show, the basis of an ideology for the Nazi party existed and would have continued to be in existence whether the Nazis had taken power or not in 1933. Similarly, the banning of the Nazi party in 1945 did not necessarily mean the end of Nazi ideas. Their lack of influence after 1945 requires another explanation. The hot fit came quickly. It is estimated that nearly 150,000 allegedly prominent Nazis, members of the S.S. or the Gestapo and high ranking officers of the armed forces, were thrown into internment camps immediately after capture. Conditions at the end of 1945 were bad and the execution of the spirit of J.S.C. 1067 (the military directive which Roosevelt had stiffened so that the German people should be made to realise that they had all connived at Nazi crimes) made matters worse. Various authors have given examples to show that the policy was pursued fairly rigorously: one should suffice here. De-nazification was at first pursued vigorously, particularly by the Americans. In their zone everyone over the age of 18 had to answer a questionnaire which contained questions about previous political affiliations. According to the results, a German could be classed in one of five categories, each, except the fifth which meant exemption, carrying penalties ranging from death to forfeiture of all property and exclusion from every job except that of manual labour. In all, 12,000,000 questionaires were issued in the American zone resulting in 930,000 sentences. The 'inevitable cold fit' forecast by Churchill followed however, and, linked with the desire of the Allies to build up West Germany as a bulwark against the Soviet Union, proved a moderating influence upon the prosecution of denazification. But the message was clear. The Allies would take strong measures to prevent a resurgence of Nazi activities in their area. The Russians took the same view: they only differed with the Allies about what they would like to replace Nazism with. The old Nazis had therefore the pressing ground of physical safety for assimilating themselves into the democratic and communist systems west and east of the Iron Curtain. But the Allies could not claim that by forcing this 'assimilation' they thereby created a new intellectual climate. Russians failed to build up in Eastern Europe stable system reflecting their view of society. The development of ideas cannot be policed, not even by the most powerful states in the world. The thoroughgoing rejection of Nazism by post-war Germany must be found in a change of heart within Germans themselves. In Foreign Affairs the continuation of Nazi visions of empire was simply not practicable. The results of the Second World War were quite different in Europe from those of the First. At the treaty of Versailles (1919), the Allies had fallen between two stools. They failed either to make Germany powerless or to integrate her fully into the European power structure as Metternich had done with France in 1815. Germany remained united and independent and, although temporarily weak, clearly the strongest power in Europe. The system of alliances which had been used in the previous hundred years to balance the power on Continental Europe was irretrievably smashed. The Soviet Union had bowed temporarily out of great power politics and the Austro-Hungarian Empire had become a group of East European nation states, weak and enticing. The demands exacted from Germany at Versailles were sufficiently strong to make her seek revenge. The safeguards against the break-up of the Versailles order were insufficient to deter it. The German state therefore possessed motive, opportunity and strength to expand after 1919. That the Nazi ideology of Lebensraum took advantage of these factors should have surprised no one. In 1945, although Germany was more harshly punished than in 1919, the splitting of Europe between America and the Soviet Union, the two clearly dominant powers after the war, left West Germany no scope for an adventurous foreign policy. Considerations of Realpolitik were- not the only factors working against Nazism. The opening of the concentration camps at the end of the war provoked a widespread revulsion in the world and within Germany itself. This revelation was new to most Germans and particularly bitter and shaming for a people which had prided itself on a powerful cultural and humanitarian tradition. The devastation at the end of the war and the years immediately after (it is estimated that 2 million Germans died as a result of the deprivation following the war) affected the German population in a way that was never the case between 1914 and 1919. If the catastrophe of 'year zero' (as some Germans called 1945) did play a significant role in discrediting Nazism and building those values which contributed to a non- totalitarian West Germany, then ironically Hitler should be given some credit, and that for a number of reasons. One of the great myths about Hitler is that at the end he was a broken man, that he had lost control of events, that he directed armies which no longer existed, that he fantasized over victory in the ruins of Berlin, that, in short, the only place he was fit to command was the lunatic asylum. Hitler was ill at the end of the war and suffered (like Roosevelt and Churchill) from attacks of nerves, but this never constituted a collapse. In fact, if anything the contrary is true. In August 1944 Hitler emerged from what Goebbels in his diaries called the Fuehrer-crisis of 1943 and early 1944 (the crisis consisted of indecisiveness and lack of interest in the war) and once more displayed his qualities of old. In August 1944 Germany had reached a position akin to that of September 1918. In both instances it was clear that Germany had lost the war even though German territory had not yet been occupied. Allied troops were advancing everywhere against weaker German forces and internally Germany was beginning to suffer as a result of the Allied blockade. In 1918 Ludendorff, the German commander, had reacted by calling his political opponents into government in order to negotiate peace. On August 22nd 1944, Hitler arrested and detained 5,000 politicians and civil servants of the Weimar Republic, amongst them the two most important politicians of the immediate post-war Bundesrepublik - Adenauer and Schumacher. He thus destroyed the effectiveness of that group to whom Ludendorff had given power and confirmed his professed desire to fight until 'five minutes past midnight'. Simultaneously he began a propaganda campaign which stressed the potential of the new wonder weapons, the Vls and the V2s, and reminded the Germans of the 'Miracle of Brandenburg', when the Prussia of Frederick the Great had been saved by the death of the Russian Tsar. The Ardennes offensive, the last German attack of the war in winter 44/45, must be seen for its importance in both foreign and domestic affairs. By attacking in the West Hitler put the question to Churchill and Roosevelt, 'Whom do you wish to see standing at the Rhine, me or Stalin?'. More important, he also made clear to those elements of the German population who wanted to let the Western Allies in (and they were numerous) that even partial-defeatism was no part of his strategy. The final steps toward national disaster came on 18th and 19th March. 1945. Hitler gave two orders for the evacuation of the civilian population from the battle areas and the destruction of all installations which might be of some use to the enemy. Such a scorched earth policy in Germany and the creation of countless thousands of refugees were attacked by Albert Speer, the German war production minister, as condemning a whole people to death. 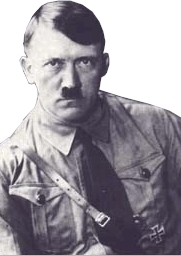 Hitler, replying with Caliban-like malignancy, gave some indication of his attitude towards the German people at the end of the war and the role, or lack of one, he saw for them after he had gone. "If the war is lost, so is the people. It is not necessary to pay respect to the basics which the German people need to eke out a primitive existence. On the contrary, it is better to destroy those very things. The German people has proven itself as the weaker and the future belongs to the stronger people of the East. The people who remain after the war are without exception the inferior; the best have died in battle".14 The spirit of these lines is fully in accord with Hitler's philosophy and reinforces a prophecy he made in November 1941 when, after the halt of the German armies before Moscow, he first considered failure. "I am, on this issue, as cold as ice. If the German people are not sufficiently strong or ready to sacrifice their blood to ensure their existence, then they should disappear and be extinguished by a stronger power. I will weep no tears for the German people".15 Nor have they for him. After the First World War Hitler derived political capital from the idea that Germany had not been militarily defeated in 1918 - rather she had been 'stabbed in the back' by people in high places who had needlessly capitulated. The continuation of the war until the bitter end in 1945 meant that no Nazi group could delude Germans about the outcome and consequences of that war, that the thousand years of German history before 1933 would have more influence than the vision of the thousand years which Hitler had promised in 1933. Napoleon was the last person before Hitler to seriously undertake the building of an empire throughout Europe. 33 years after his downfall, his nephew came to power in France, not the least of whose attraction was that he carried the same name as his uncle, and with it some of the glitter. More than 33 years have passed since 1945, but a similar development in West Germany remains the remotest of possibilities. 'Where das Betreten's not verboten' means roughly 'Where taking a walk is not forbidden'. The lines are taken from the poem 'The Old Vicarage, Grantchester' in 1914 and Other Poems (Faber and Faber, 1941). Quoted in Amos Elon, Journey Through a Haunted Land, p26. Quoted in James J. Sheehan, German Liberalism in the Nineteenth Century (Methuen, London 1982), p279. Christian Zentner: Adolf Hitler (Delplin Verlag GMBH, Munich 1979), p80-8 1. Quoted in Hans Kohn, Wege und lrrwege (Droste Verlag, Duesseldorf 1962), p173-174. Leland Stowe, in the prophetically titled Nazi Germany Means War (Faber and Faber, London 1933), p54. Winston Churchill, The Second World War, Vol 6, p306. In Der Fragebogen; 'the questionnaire', Ernst von Salomon (Rowohlt Verlag, Hamburg 1951). Quoted by Aidan Crawley, The Rise of West Germany 1945-72 (Collins, London 1973), p50. Evidently Crawley was not convinced that Americans could behave naughtily, so he asked Carl Blessing, later President of the Federal Bank, who was in the same camp, if von Salomon's version was true. Blessing confirmed it and said he himself got the same treatment. So Hume's analysis rules out the notion that there are latent urges in people which politicians can rapidly fashion into coherent political movements. The adoption by any country of a policy - say - of totalitarianism and extreme nationalism glorifying the state is dependent upon the successful development and propagation of an ideology of totalitarianism and extreme nationalism glorifying the state. "No nation in the world can think so greatly and so humanly of its state as can Germany. None strives so seriously as the Germans to reconcile the ancient contrasts in the life of the peoples, the power of the state and the liberty of the people, well-being and armed strength, science and faith. And because the foreigners sense this, they hate us"
Later Mann managed to swallow his distaste for the West and condescended to emigrate to America in 1933. In 1914, this contradiction lay in the future. He welcomed the war as the best safeguard against the democratisation of Germany, as "purification, liberation, an enormous hope . ."
He compared the nation of shopkeepers (Great Britain) with the nation of heroes (Germany). "We must recognise everything which resembles Western European ideas or which is even distantly related to commercialism as something much inferior to us . . Militarism is the supreme manifestation of the heroic spirit. It is the highest form of the union of Potsdam and Weimar. It is Faust and Zarathustra and the Beethoven scores in the trenches ... "
"I call upon all those who have marrow in their bones and blood in their veins ... Become men! We do not want any more chatter about culture and world citizenship and Germany's spiritual mission. We need hardness, a bold skepticism, a class of socialist mastermen"
People who see the success of Nazism as the result of the 1929 economic crash, or some deeply ingrained characteristics and traditions in German society, or a combination of both, are not giving full due to one stark, simple fact; namely the development in Germany of ideas rejecting unashamedly the liberal-rationalist worldview. When he staggered to his feet he turned to the officer who had sat chewing gum whilst the beating went on and said, "You are no gentleman". (Another European falls victim to the propaganda that the English public school is the fountain of morality in the Anglo-Saxon world) This remark was greeted with roars of laughter. "We are boys from Mississippi", the Military Police declared and kicked von Salomon through the door. "If the war is lost, so is the people. It is not necessary to pay respect to the basics which the German people need to eke out a primitive existence. On the contrary, it is better to destroy those very things. The German people has proven itself as the weaker and the future belongs to the stronger people of the East. The people who remain after the war are without exception the inferior; the best have died in battle"